Good quality product and doesn't add bulk to the phone. Really like ph case I ordered. Sleek protective and looks great. I was looking for a new phone case that would compliment the look of my phone and provide good protection from damage. As my previous Obliq case protected my phone really well and had a great feel to it, I decided to go with Obliq again. Although this case was on the expensive side, I was not disappointed. It looks and feels great without adding extra bulk to the phone and I trust it will provide good protection should I drop it. I would definitely recommend this case. I bought 2 of these as my wife had lost her case and I fancied a change.They were .99p each! Plus postage. Very nice quality, I can only assume they were clearing this colourway as other colours were £9.99. Lovely colour, looks classy and I love it. However if you're someone who wants to show off the iphone logo on the back of your phone then it wouldn't be suitable but I'm not so for me it's perfect. I was looking for a case to compliment my rose gold iPhone 6s, and either they were boring or not what I was looking for. This case is really beautiful to look at. The brushed metal look is really stunning and adds that extra bit of fanciness to the case. The brushed metal part is the exact same shade as the rose gold iPhone. And the pink gold around the edges is lighter than the rose gold but super pretty and adds some nice dimension to the case. The case fits perfectly as well, and has a slight grip to it which is defiantly an advantage. It's not the slimmest of cases you could get, but it's pretty damn close especially for the protection you get. All in all, I'm extremely happy with this case, and would recommend it! 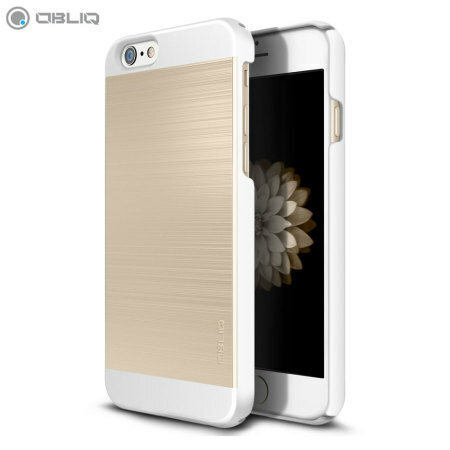 Protects my iPhone & screen without adding too much bulk and matches the rose gold colour virtually perfectly. Arrived promptly, very happy! She likes it because it looks classy and she likes the brushed steel look. I am happy because she is happy, and because the phone is well protected. The little lip around the surface of the screen is great as there is no way of either the sceen or the phone edges being scuffed, and it does not interfere with daily use. Getting a 12yr old to stick with a good cover is a tricky business... But this trick worked.